Artemis Fowl has steadfastly held on to the belief that his father is missing and not dead, even though it’s been two years. He is in the middle of playing mental games with the school councillor when the call from his bodygurad – Butler, comes through. Contact has been made from Russia, the last place his father was known to be alive. On his way to Russia, the last place his father was known to be alive, Artemis is waylaid by Captain Holly Short of the Lower Elements Police Reconnaissance squad. Someone has been smuggling contraband and Artemis is her primary suspect. Artemis agrees to help the LEPRecons find the smuggler if they will help him rescue his father. Sometimes situations require the most unlikely of alliances to be formed. The big question though is are Holly and Artemis capable of working together with all that’s gone between them, or are both missions doomed to failure. And who is the pixie mastermind behind the smuggling operation? 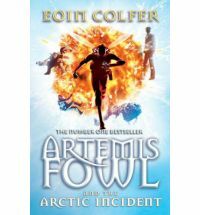 A return to the world of Artemis Fowl, whose mind is complex and brilliant, though maybe not as brilliant as he always thinks. Aided and guarded by the stoic Butler while banging heads with the LEPRecons, Artemis’s schemings are always a pleasure to read. The characters are fun, I am partial to the dynamic between Artemis and Foaly, this book also sees the welcome return of Mulch Diggums. An enjoyable and layered adventure.